In this lab, you will examine cells from a variety of organisms. The finished product for this lab will be a ¼ page sketch of each type of cell, accompanied by your written comments and observations. Use the attached data sheets to record your observations – use the space next to each sketch for comments and to answer the questions asked. Take you time, sketch in pencil, and note any visible structures and colors. Pull a thin outer layer of onion “skin” from the onion provided – it should resemble plastic wrap. Make sure the sample is THIN! Place the skin in a small drop of water on a clean glass slide, then add one tiny drop of METHYLENE BLUE stain. (CAUTION: METHYLENE BLUE WILL STAIN HANDS, FLOORS, CLOTHING AND ANYTHING ELSE IT TOUCHES!) Wait one minute, then add a cover slip. 1. Place the torn edge of a piece of paper towel against one edge of the cover slip. 2. Add a drop of water to the OPPOSITE edge of the cover slip. 3. The paper towel will absorb the stain and pull the clean water through the sample. If this is done properly, you will see that certain portions of the onion absorbed the stain, while others did not. 2. What parts of the onion cells absorbed the stain? 3. 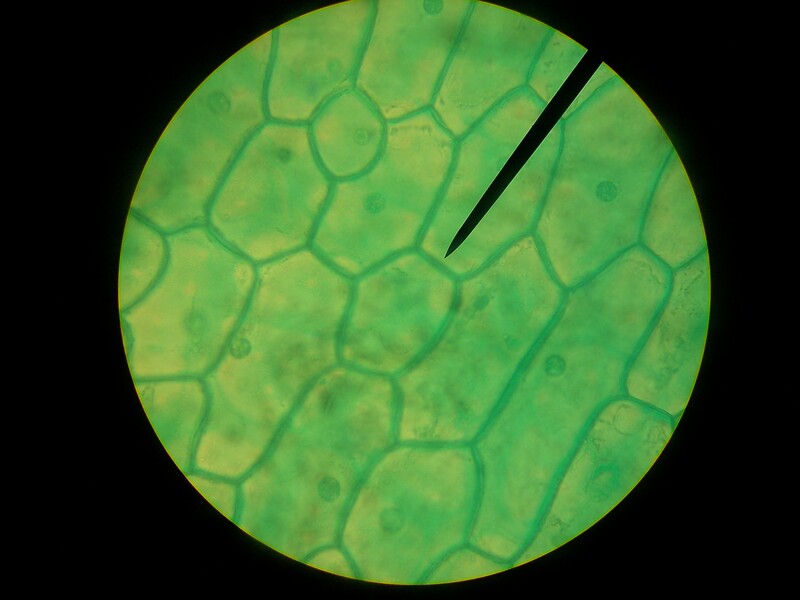 What is the arrangement of the onion cells? 4. Label as many parts as you can identify. You will now observe some of your own cells. Place a drop of water on a clean slide. Use the large, flat end of the toothpick to scrape the inside lining of your cheek gently. Stir the end of the toothpick in water to mix the cells. Place one drop of METHELYNE BLUE into the water drop to stain the cells. Wait one minute, then add a cover slip. Remove the stain from the slide as you did for the onion. When you are finished with this slide, WASH IT WITH SOAP and rinse it clean. 1. How do the cheek cells differ from the onion cells? 2. What parts of the cheek cells absorbed the stain? 3. Describe the arrangement of the cheek cells. If they are arranged differently from the onion cells, why might that be? 1. How are the cork cells different then the onion cells? Can you draw any conclusions? 2. (Honors biology only) Who was the first person to observe a cell? 1. Sketch some of the interesting cells you find (determine size in microns)then write a few observations and label the sketch. 2. 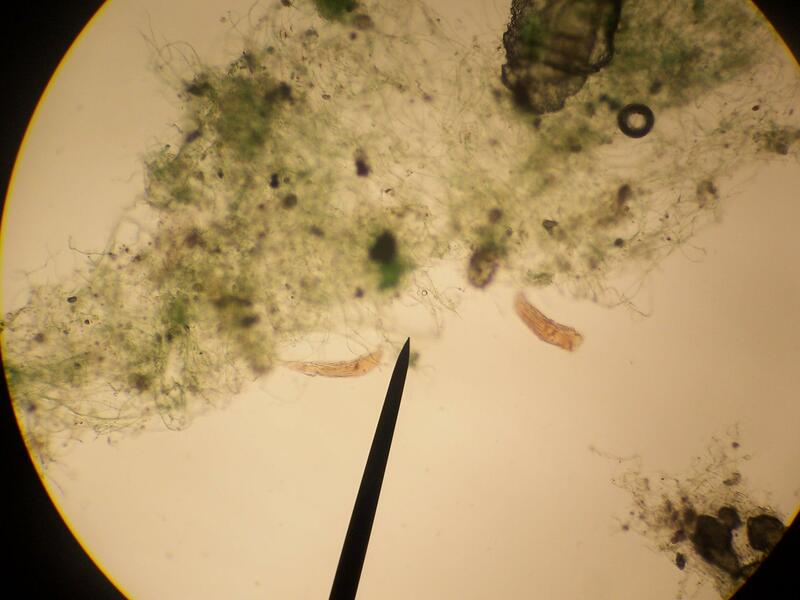 (Honors biology only) Identify the organisms found in the pond water using any resources available. Make a wet-mount slide of growing yeast cells. You only need one drop from the yeast culture; do not dilute or stain this sample. Place a cover slip over the sample, then focus and move to a high power to view these tiny cells (very round shaped). See if you can find cells that are dividing to create new cells! 3. Collect data from other lab groups and determine average amount of new cells per 5 minutes and every minute.